In this year of municipal elections in British Columbia, housing was consistently the top-ranked issue for residents of Metro Vancouver – with the exception of Surrey, where public safety was deemed more important. Many campaign platforms, from winning and losing contenders, devoted paragraphs to housing policies. One of the first efforts to deal with housing anxieties was designed by the previous provincial administration. In August 2016, when the BC Liberal government implemented a 15 per cent surtax on foreign homebuyers in Metro Vancouver, the reaction from residents was overwhelmingly positive. At the time, British Columbians had little trouble supporting a fiscal policy that would not apply to them, and one that would – conceivably – lead to a level playing field for residents who wanted to get into the real estate market. Still, popularity came with a caveat. A survey I conducted in September 2016 showed that 76 per cent of British Columbians supported the foreign-buyer’s tax, but two thirds (68 per cent) thought the policy would be “unsuccessful” in making it easier for British Columbians to own a home. Yes, it is possible to like what a government is doing and still think it will be futile. A more controversial discussion emerged over what is sometimes referred to as the “additional school tax.” The introduction of a tax of 0.2 per cent on the value of homes worth between $3 million and $4 million, and a tax rate of 0.4 per cent on the portion of a home’s value that exceeds $4 million, was deemed a “very good” or “good” idea by 67 per cent of British Columbians in May. 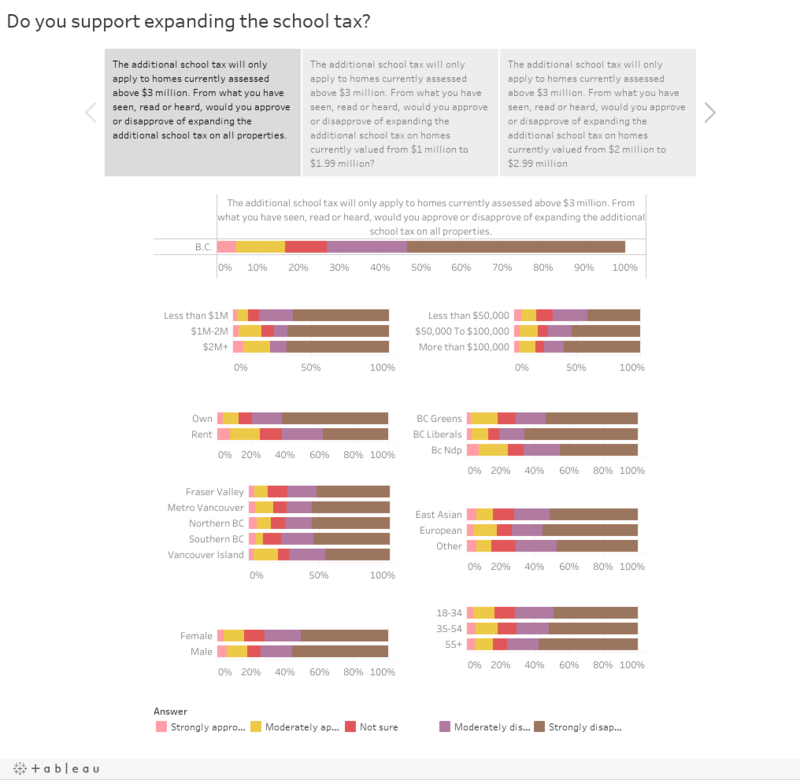 As expected, support for the “additional school tax” was lower among residents who live in high-priced homes. This is an element that the foreign-buyer’s tax never had: citizens and would-be voters being asked to contribute more in the name of housing affordability. In September, Research Co. asked, on behalf of StepUp BC, about the possibility of the “additional school tax” being expanded. 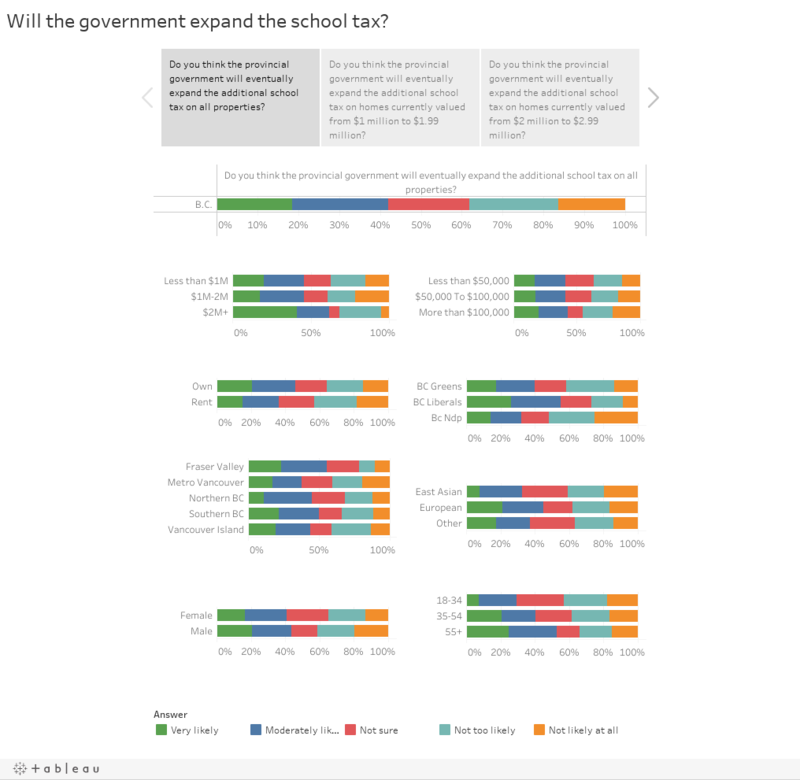 The survey found that 70 per cent of British Columbians thinkthe provincial government will likely expand the additional school tax to properties valued from $2 million to $2.99 million. Three-in-five British Columbians (61 per cent) said they would approve of that degree of expansion. However, there is a big difference in the way those who reside in a property currently assessed at $2 million or more feel about this expansion: two thirds of these homeowners (66 per cent) disapprove of the policy. The foreign buyer’s tax – in all of its forms and under different governments – never caused strife among voters. It achieved a status that is seldom seem in a province as polarized politically as British Columbia, with NDP voters approving of the actions of Christy Clark in 2016 and BC Liberal voters thinking the current government’s changes were admissible in 2017. The additional school tax is unusual. Many homeowners fear that their property could be next in line, if an expansion is contemplated down the road. 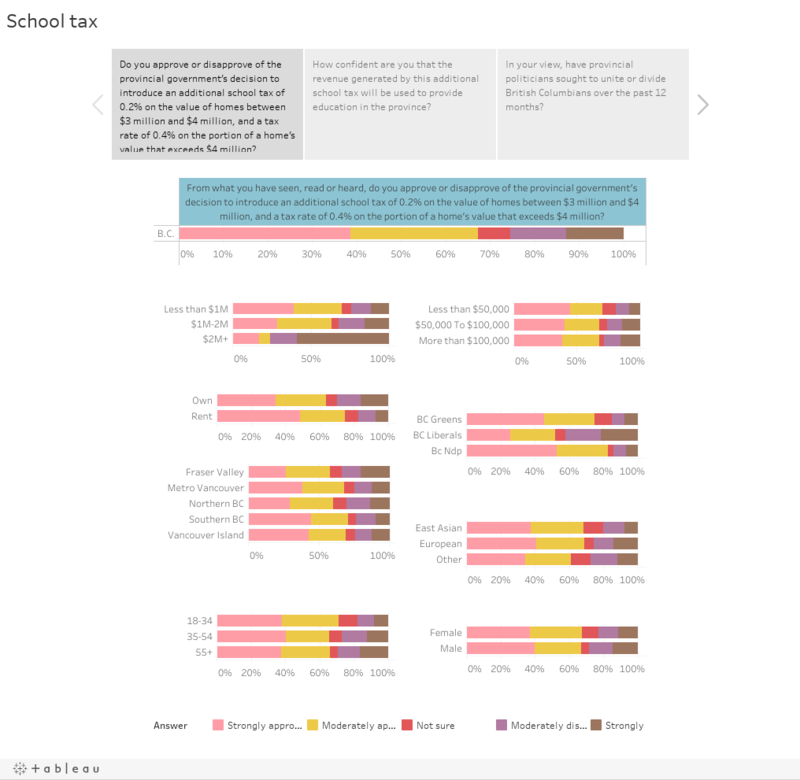 Another issue that will challenge perceptions is that 57 per cent of British Columbians are not confident that the revenue generated by the additional school tax will actually be used to provide education in the province – a gentle reminder that a policy can be popular and lead to skepticism at the same time. The battle for the hearts and minds of residents when it comes to housing will be inherently emotional. Metro Vancouverites have many examples of friends or relatives who left the region because it simply became too expensive. This is the kind of malaise that does not get fixed by issuing press releases that mention the number of homes or units created. Politicians need to be very careful about the way in which the debate over housing will develop. Once a year has passed with the new taxes in place, voters will demand to see real results from the revenue that was collected. There needs to be a positive emotional connection with British Columbians for these taxes to remain popular and supported. At this early stage, sentiments such as skepticism and concern are present.